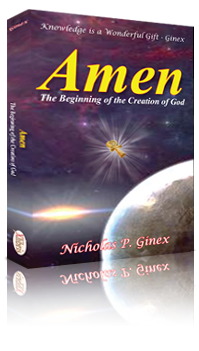 Nicholas P. Ginex book AMEN reveals with extraordinary depth the most provocative thoughts about when, where, and why Amen still exists in the minds of worshippers. Amen focuses on the central themes, messages, conclusions, and recommendations presented in the historical novel Future of God Amen. Both novels surfaces facts and findings by religious scholars and respected Egyptologists to undisputedly prove that Amen is the beginning of the creation of God. Nicholas unfolds a history of how a spiritual people conceived one-universal God Amen and describes the many attributes that have made this God remembered throughout the ages. Reasons why the Gospels were written by Hebrew priests. Who developed the beliefs in a soul, hereafter, Son of God, and one-universal God. What is the Word of God; a command announced three times in John’s Gospel. That Judaic, Christian, and Islamic religious leaders must unify their belief in God. Word of God – love one another.